Gomateshwara Bahubali is a Jaina God and He is also simply known as Bahubali and Gomataswami. He was the son of Rishabhanatha (Adinath), the first Tirthankara. Yasavati and Sunanda were the two queens of Rishabhdev (Adinath), the first Tirthankara. Bahubali was born Sunanda while the other queen gave birth to Bharata and many other sons and daughters. Rishabhanatha divided his kingdom between his two sons: Gomateshwara and Bharata. Bharata embarked on a trip to triumph over other kingdoms, in pursuit of becoming a Chakravarti, a world conqueror who subjugated six continents. He expected Bahubali’s submission as well – Bahubali refused and the brothers engaged in duels, Bahubali won the first two and in the third duel he showed his superiority by lifting Bharata in his arms to dash him to the ground. Bharata called for his divine disc weapon (Chakra Ratna). The Chakra Ratna appeared but instead of harming Bahubali it went round him and stood on his right side. At that moment, Bahubali realized that he was about to commit the sin of fratricide and he gently put Bharata down. Though he was the victor, Bahubali was full of remorse because he felt that in defeating his brother Bharata, he had insulted him – the man who was acknowledged as the universal monarch. He begged his brother’s forgiveness; fled to the forest, pulled out his hair and stood in the Kayotsarga posture, which is taken to abandon the body. Gomateshwara Bahubali performed intense austerities standing in the open, hence, in course of time creepers grew around and all over him. An anthill grew around his feet, vines and snakes began to embrace his body and hair. In spite of severe self-mortification, he failed to attain kevalagnana or omniscience. Concerned and perturbed by his brother’s condition, Bharata sought the advice of a sage who informed him that Bahubali still suffered from pride and resentment. Accompanied by his two sisters Bharata went to Bahubali and whispered “Dismount from the elephant of pride”. With this Bahubali understood that he had not been humble enough to go and bow before his younger brother. The direction of his thoughts changed and as he made his final bow, he attained omniscience and liberation (moksha) in matter of moments. Because of this Bahubali is a symbol of the highest form of detachment. He is considered as a human form of penance, severe austerity and complete meditation and his story evokes great admiration and devotion. His images are shown exactly like this, as for instance the life-size images in cave 32 at Ellora belonging to the 9th century AD. 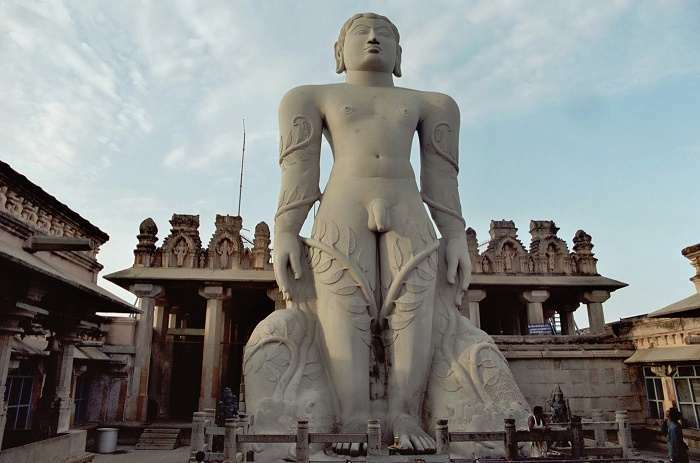 The most well known statue of Gomateshwara Bahubali is the one at Shravanabelagola, Karnataka. This 57 feet tall was erected in 983 AD during the reign of Ganga King Rachamalla. Mahamastakabhisheka, the head anointing ceremony is performed once in 12 years to the 57 feet tall monolithic statue of Lord Bahubali at Shravanabelagola.